Art and Medicine Bibliography, Edward Lund. London : J. & A. Churchill, 1885. Description : [i-vi], -116 p., [4 l. pl.] ; ill., 4 photo. pl. ; 21.8 cm. 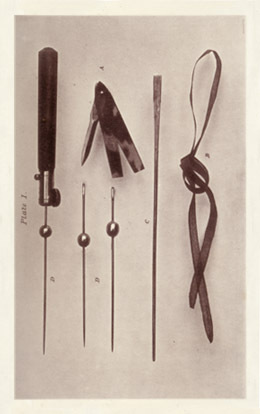 Photographs : 4 photo plates (autotypes) of surgical instruments. Member of the Royal College of Surgeons, Council and Court of Examiners. Professor of Surgery, Owens College & Victoria University. Consulting surgeon to the Manchester Royal Infirmary. Inscribed: Edward Bellamy Esq., with the author's best regards, January 1886. "Lund had the great merit of having been one of the first to recognize the immense practical importance of Lister's employment of antiseptics in operative surgery, and his reputation and influence were very valuable in bringing about the acceptance of antiseptic surgery in Manchester. His skill as an operator and his ingenuity in devising methods of treatment contributed largely to his success both as a teacher and practitioner." — Plarr's Lives of the Fellows. Plate III, fig. 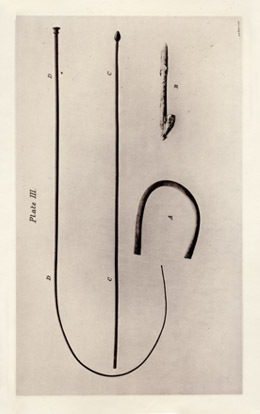 B. is an ivory section of a crochet needle which was accidently pushed into the bladder of a patient who was self-treating for stricture of the urethra, following the bad advice of a quack. 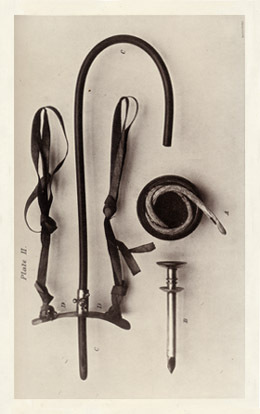 Dr. Lund tried to remove the object, per urethrum with forceps designed for this patient and fabricated by Charrière, but failed. 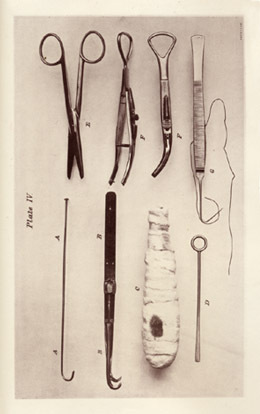 After 5 months Lund performed lithotomy and removed the ivory which had become encrusted with phospates. In a similar case, Fig. A. is a piece of rubber tubing removed from the bladder of a ten year old boy who mistakenly believed he could improve his jet d'eau.